On this page, we will keep you updated with Falconry Scotland's upcoming events and other related news, so please do check back regularly for updates, thank you! Page last updated: January 19 2019. We look forward to seeing you at our Shieldaig Lodge Falconry branch when we re-open! Our New " Raptor Experience "
We are excited to announce that we are now offering our new Raptor Experience as our latest bespoke bird of prey experience! 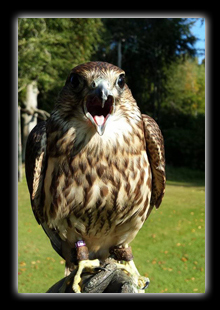 To find out more about our Raptor Experience, please visit its dedicated page by clicking here! 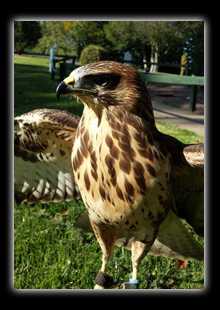 This new experience takes the place of our old Hawk Walk experience as we have found that the Hawk Walk is available at many other places offering bird of prey experiences, which is why we have come up with our new dedicated Raptor Experience! 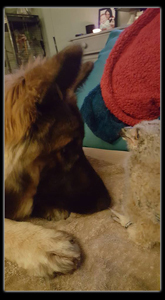 We are pleased to announce that our 2 latest members of our family, Byron our Bengal Eagle Owl, and Bailey our Asian Brown Wood Owl, are both flying free without the restriction of the creance (training line), and are now partaking in our experiences with customers! Here are a couple of short videos of Byron & Bailey in action! Byron & Bailey are available in our experiences such as our Owl Encounter, Mixed Hour, Ultimate Experience & Children's Activity! We are sad to announce that Dolly, our beautiful Common Buzzard, past away on Wednesday night with Kylie and Georgie by her side. She has blessed our family and all our customers who had the opertunity to fly her, over the past 34 years of her amazing life, and she flew up until her final days. Thank you Dolly for gracing us over your many years. Fly high Dolly. You will be forever missed and within our hearts. 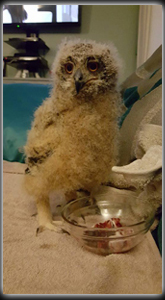 We have added the species information to the 'Our Birds' page of our website, to include our latest members to our flying team - Bailey, our Asian Brown Wood Owl, and Byron, our Bengal Eagle Owl. Please check out the 'Our Birds' page to read a short description about the species! 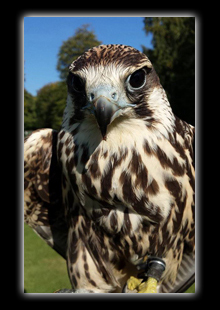 We would like to thank those that have provided, and permitted us use of for our website & other promotional media such as leaflets; photographs they have taken whilst at Dalhousie Falconry, either as a visitor or as a customer who has been on an experience with us and our birds of prey. Credits and Thanks to those visitors/customers who have given us permission to use their photographs are listed here below & are also listed on our Copyright & Disclaimer page. Our Site Guestbook is now online! We would like to announce that our site Guestbook is now up & running, ready for our customers to write reviews about their time at Dalhousie Falconry whilst partaking in their chosen experience(s)! To read & write reviews on our site Guestbook, please click here to be directed to the Guestbook page. Another New Addition to our Team in 2016! 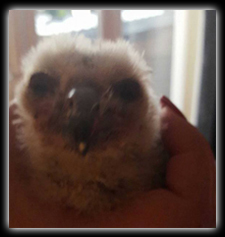 We'd also like to introduce you to another new arrival to our flying team - Bailey, our 4 week old Asian Brown Wood Owl! We will be posting regular updates regarding the progress of Bailey, from his growth to his training, so please check back regulally for updates! 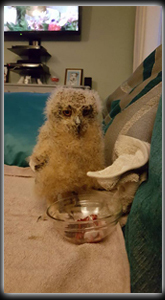 Bailey is currently only 4 weeks old (Fri 20 May '16), so we are currently in the imprinting stage of his rearing, to which he is being handled gently by as many people as possible, as well as being fed numerous times throughout the day. Bailey. 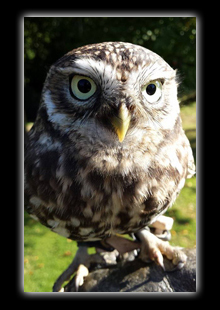 like our other new addition - Byron (see below), will be used as part of our flying team in experiences such as our Owl Encounter, Mixed Hour & Ultimate Experience - after some fun training time of course! We will be keeping you updated on Bailey's progress of both his growth and training here on our What's New page, so please do check back regularly for updates, including photos of his fast growth! Should you also be partaking in any of our experiences at our centre over the next few months, you will be lucky enough to see baby Bailey also! The Latest Addition to our Team in 2016! Some photos of our Byron; the latest addition to our team, now with his ring on his leg since it is large enough and also spending some time with our Manager - Kylie's, dog Flloyd! The 2 photos of Byron at then end of the row beneath are that of Bryon, now at just 4 weeks old! 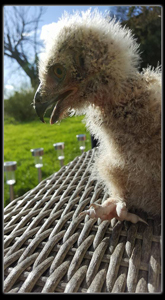 Oh - last Monday ( 17th Apr '16 ), Byron, at 3 weeks old, weighed in at 15½oz! More photos will follow! We have updated Byron's "Profile Photograph" below, were he is now 5 weeks old! 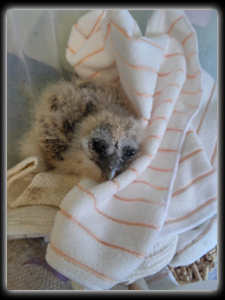 You can see from the other photos of Byron, the fast growth rate of these Owls! Last week, at 4 weeks old, Byron weighed in at 1lb 13frac12;oz, whereas the previous week at just 3 weeks old, he weighed 15½oz! 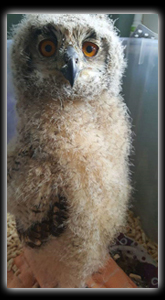 So far this year we'd like to introduce you to the new arrival to our flying team - Byron, our 14 day old Bengal Eagle Owl! We will be posting regular updates regarding the progress of Byron, from his growth to his training, so please check back regulally for updates! Byron is currently only 14 days old (Tue 12 Apr '16), so we are currently in the imprinting stage of his rearing, to which he is being handled gently by as many people as possible, as well as being fed numerous times throughout the day. Whilst he is at our centre, he is held in an imprint chamber of which has a heat lamp to keep him warm in the cold periods of the Scottish Spring! 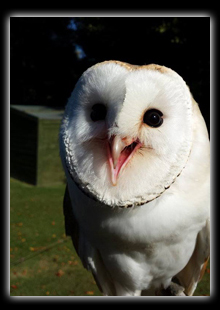 Byron will be used as part of our flying team in experiences such as our Owl Encounter, Mixed Hour & Ultimate Experience - after some fun training time of course! We will be keeping you updated on Byron's progress of both his growth and training here on our What's New page, so please do check back regularly for updates, including photos of his fast growth! Should you also be partaking in any of our experiences at our centre over the next few months, you will be lucky enough to see baby Byron also! and a 4 Star Award from Visit Scotland . We would like to thank all our customers for helping us achieve these awards! New Additions to our Flying Team in 2015! This year we'd like to introduce you to the new arrivals to our flying team! Alfie is not the male we thought he was! "He's" far too big for a male, so "he's" definitely a female with a boys name... never mind! Alfie is currently chasing the lure on the training line (creance) too and will soon be ready to come off the creance soon! Alfie also likes to be heard and likes wiping his dirty beak after a feed on your jumper! Dill is 14 weeks old and is still on the training line but is now catching the lure and doing very well. We put new bells on Dill the other day and he wasn't sure what to make of them lol! He also, being an imprint, much like Alfie, likes to make himself heard! Marley is coming along very well with his training, now that he has decided what his weight needs to be! He is looking forward to starting his Wedding duties next year!! He is very vocal and likes to be heard - definitely an attention seeker; he loves people watching and has a very big shoe fetish!! And definitely a mummy's boy!!! 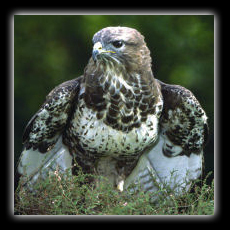 Tucker is our new Buzzard as our other Common Buzzards are very old now! He is a very friendly individual and is flying very well. He has settled in well and we are sure he will become a valued member of our team! All birds are doing really well in their training and you will soon see them as part of our flying team! We would like to announce that Georgie has been promoted to Assistant Manager at Dalhousie Falconry. Well done Georgie! Well done to our Georgie, Gareth and Tom for passing their Archery Instructors Course back in July 2015! We are pleased to announce that our new website has been published & we hope you like our new site just as much as we do! We are currently still adding new photos and content to our new website, so please check back regularly to view any further changes we've made! Last modified: January 19 2019.